MapCarte 58/365: Karte der Gegend um den Walensee by Eduard Imhof, 1938. This original image measures 9.6m in width and illustrates he area around Walensee at 1:10,000. Created by Eduard Imhof, the work appeared in his classic text Cartographic Relief Representation which had a single purpose in teaching the means by which to represent relief in maps. 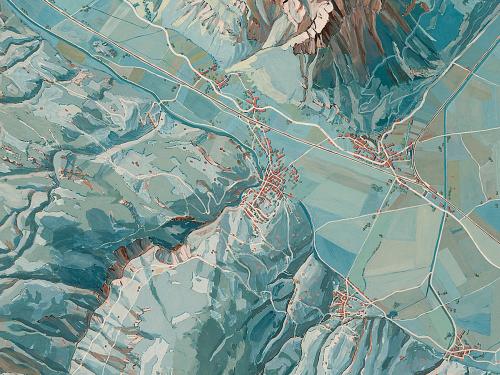 This is a painting in gouache that Imhof used to show a plan view portrayal as naturally as possible. Imhof employed the techniques of a landscape painter. All linear elements that might be produced using woodcuts, etchings, engraving or lithography are removed since they are abstract and do not appear in a natural landscape. No aerial photographs or existing maps were used as underlay. The result is a beautiful, aesthetically pleasing impressionistic painting yet one that is highly accurate. The virtual library of Eduard Imhof is here. This entry was posted in MapCarte and tagged artistic, MapCarte, relief by @kennethfield. Bookmark the permalink.